Aly is obviously an Irken. She looks exactly like my display picture. Height: .... She is just short. Probably as Tall as Zim. 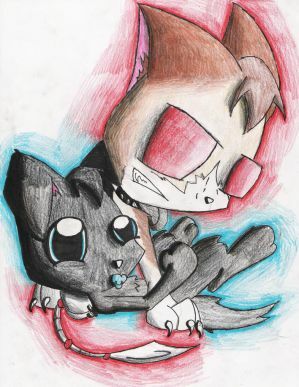 This is a very old and very embarrassing art picture of them both. But thats the general Idea of how they look. Mel did this one of them. Thank you hun. Anyways. Both were made from scraps and you could probably distinguish there persona already. She made her way down to earth and forever has been working with Zim. But not to give it to the tallests but she wants to sercretly destory the dirty ball. Human: Her human disguise has a lot of faults to it. She has Fox Ears and a tail. Since she has been working with hands on technology and scrap metal, its hard to make a successful working machine and your bound to have some faults. yes. So there you have it. She had typed in everything that humans would consider normal that she knew of on earth. Well.. if you put a malfuctioning machine, and that together... well there`s her human disguise. Kir and Tir look cute <3 I love the way you drew them. Yay! :'D Welcome to the board and such, hope you fit in nicely! I hope to RP with you soon!